Recognize any of these scenarios? How would you know why your horse is doing any of these things without communicating with them directly so they can tell you what’s wrong? AND participate with you to resolve the problem? They spook or run away with you? They pull the reins out of your hands, or are so heavy on the forehand it feels like you are trying to hold them up? They bite or nip you? They dance away from you, turn their tail toward you, or run off when you approach them? Sometimes they swish their tail constantly while working, or shift their weight from side to side a lot? They don’t listen to your signals, aids or follow your cues? Do they act aggressively toward you or other people? Or do you have a horse who is extremely shy, nervous, or skittish? Can they not seem to hold still, jigging constantly, with little focus or concentration on the job at hand? Are your performance scores not improving, or do you feel stuck in your training? Do they exhibit obsessive compulsive disorders like cribbing or pacing? Do they just wind up getting sick a lot or suffer with mystery lameness issues? Horses do feel pain, sadness, anger and grief, they reason and think, and they always make decisions which make sense from their viewpoint. They will also display nervous anxiety and stress symptoms when something isn’t right in their world. And they will do everything they can to tell you about it. The question is, are you listening to them? Once you understand their perspective, their viewpoint and what really makes them tick, then everything else gets so much easier. And the only way to do that is to communicate with them. When we become better horse owners, riders and trainers, it helps us become better humans! Solving behavior problems begins with communication between you and your equine friend. We do know that your animal always does what seems right to them — from their own viewpoint. 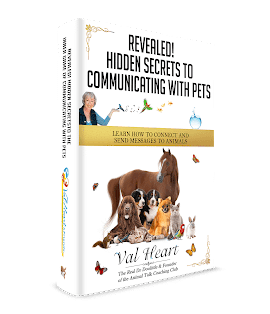 Without communicating specifically and directly with your animal, we won’t know exactly what’s really going on from their viewpoint, or how best to resolve it. Val’s success rate is better than 90%, but of course all situations and beings are highly individual, and their needs are uniquely their own. Contact her to get personal assistance in returning your horse to a happy state and one who enjoys everything in their environment including the work the two of you do together as a team.